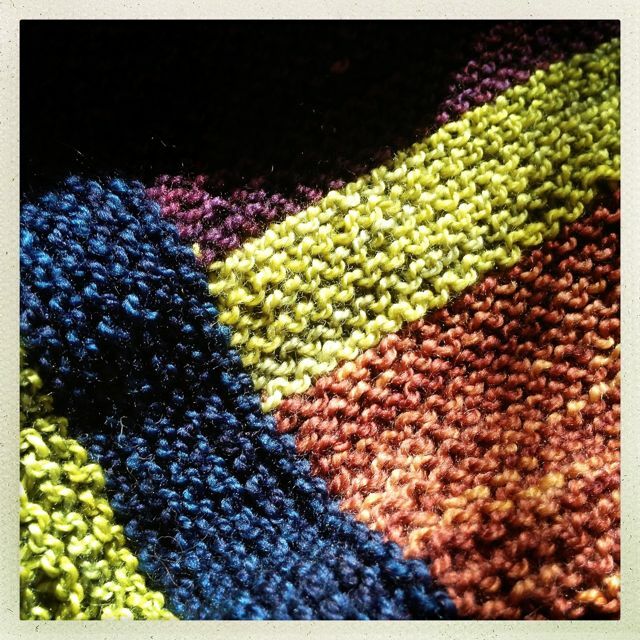 Garter stitch is good. 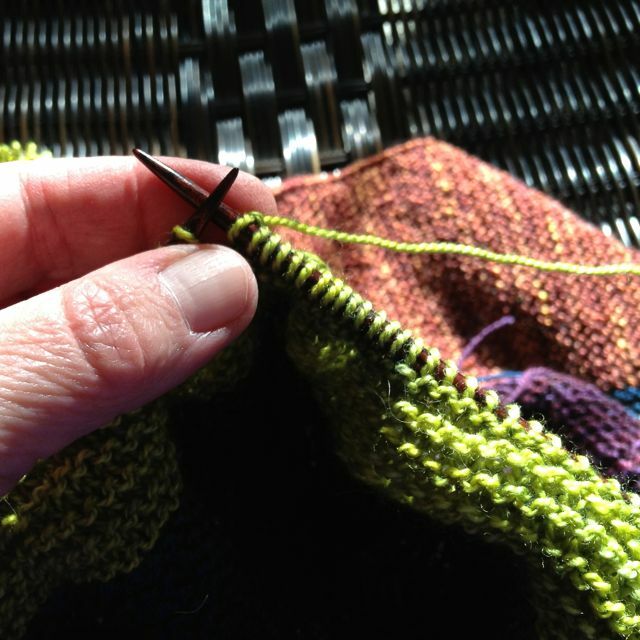 Garter stitch in rich colors and strips and blocks is even better. I don’t even mind that the rows I’m working on at the moment are something like 450 stitches long. Simple knitting helps me think. As I go along my mind wanders to other projects: how I could construct that lace insert, where I might place the increases to create the shape I want. I stop to make notes, then pick up Carlisle again, and knit knit knit. Before long, I’ve reached the end of a row. Do I have time to start another one? Sure, why not? Walking around a track is a little like knitting garter stitch. We start where we put our jackets and water bottles, and walk walk walk. After a few minutes, what do you know, here are our jackets, and we’ve walked a lap. Click the counter, begin another lap. Sometimes it seems to take forever, just like 450 stitches might seem to go on and on. Most of the time, though, I’m surprised to see my stuff there. Click. I walked a mile. Rho and I talk, or just walk, and time passes. Just like knitting garter stitch. I’m taking my garter stitch on a short trip to Maine tomorrow. Judy and I are retrieving Remarkable Rachel and all her belongings from college, so there will be lots of car time to knit knit knit. I’ll make sure we wave at The Great White Bale as we pass Biddleford!